Ignore the rude service of the monkeys at the Desi Galaxy counter (1700 Sugar Tree Plaza, Oak Tree Road) in Edison, NJ. Instead, focus your energies on the chaat, Indian street food. The other day we were in a rush and wanted to grab a quick bite in Edison, NJ. So, we headed into the new Desi Galaxy food court adjacent to Hot Breads and close to Apna Bazaar. At first we ordered plain Samosas but upon seeing someone’s colorful plate of Samosa Chaat, we started drooling in a reflex action. We quickly changed our order to Samosa Chaat. The girl at the counter asked us, Spicy or Medium? Although, we were told by the girl that it’d take just 2-minutes, it took over 7 minutes for our Samosa Chaat to be ready. Finally, the lazy cow waddled back depositing our plate on the counter accompanied by a loud yell, Samosa Chaat. Samosa Chaat included two piping hot medium size samosas, chopped onion, cilantro, green chilly, tamarind sauce, red chilly sauce and a dab of yogurt. One spoon and we more than saw glimpses of heaven, we saw the celestial nymphs Rambha and Menaka. After the second spoon, we wondered if medium spicy was so hot then how much hotter the Samosa Chaat would be if it were to be spicy? We have a feeling that the lazy chatting cow made our Chaat spicy instead of making it medium spicy. Consoling ourselves that Indian cows are made that way, we focused on our Samosa Chaat. 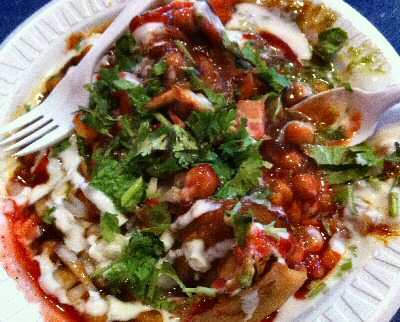 Its high spice level notwithstanding, the Samosa Chaat at Desi Galaxy was a delicious, yummy treat. SearchIndia.com recommends this Indian street food at Desi Galaxy but make sure the idiots at the counter know the meaning of Medium Spicy. 4 Responses to "Samosa Chaat @ Desi Galaxy – Sheer Bliss"
You’ve found the best Samosa Chaat for miles, but I can’t believe the heat was too much for you. I have to ask for “hot” and beg. Only then can I experience what you did. You write: I have to ask for “hot” and beg. Only then can I experience what you did. You are not the first American to say that. Obviously, Indian restaurants in NJ/NYC do not believe you guys can handle the heat and that your requests are mere bravado. If we lived close by, we’d head to Desi Galaxy (Sugar Tree Plaza) every evening. Alas, we’re 120-miles away. Indeed. The worst moments on Oak Tree Road come when a poor non-Indian slob like me winds up right behind some well-turned-out Indian family that demands their food “mild.” Why in heavens would anybody want Indian food without spices? As for disguising myself. I’m pretty much the only non-Indian regular in the neighborhood and would be spotted in a second. Everybody seems to know me – and they all make sure there’s enough spice in my food. You might be surprised to know that the ABCDs (second and third-generation Indian-Americans) can’t handle too much heat in their food. BTW, the grapevine has it that two Indian restaurants on/around Oak Tree Road are up for sale! It seems to me that Oak Tree Road restaurants change hands constantly. Most recently, we’ve witnessed the conversion of Idly Corner to Sri Ganesh Dosa House. I wish the best of luck to anybody who dares open a restaurant on my home turf. I promise that I’ll give them at least one chance. We’ve been to the Idly Corner on Oak Tree Rd and Green St once. And to Ganesh Dosa House (the Newark Ave branch in Jersey City) several times.